Summer is coming and you know that means, it’s festival season! What better way to kick if off than with the 37th Annual TASTE of Tippecanoe!? This Saturday, June 16th, from 4 pm to midnight come out and experience the food, music and fun for all ages! Restaurants from Mary Lou Donuts to the EMT food truck and McGraw’s Steak Chop & Fish House will be vendors at this event! Check out the full list of vendors who will be at TASTE here. Also don’t miss out on the TASTE Fireworks that will be set up on the Depot Stage which will be synced to a DJ Powder mash-up set! 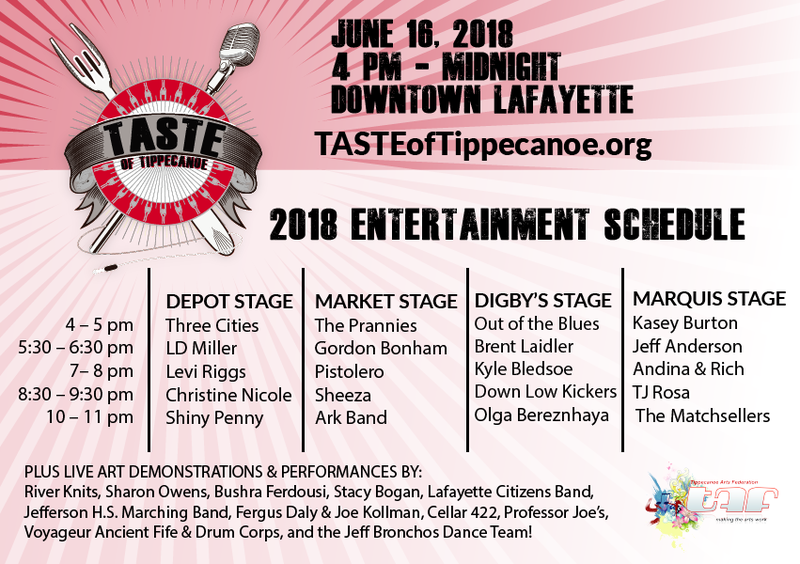 Not only does TASTE of Tippecanoe offer local food and drink vendors, live music, art demonstrations and fireworks, but this event is also a major fundraising event for the Tippecanoe Arts Federation (TAF). TAF provides opportunities within the arts community as well as outreach programs for at-risk youth! Come out and watch Downtown Lafayette come alive! 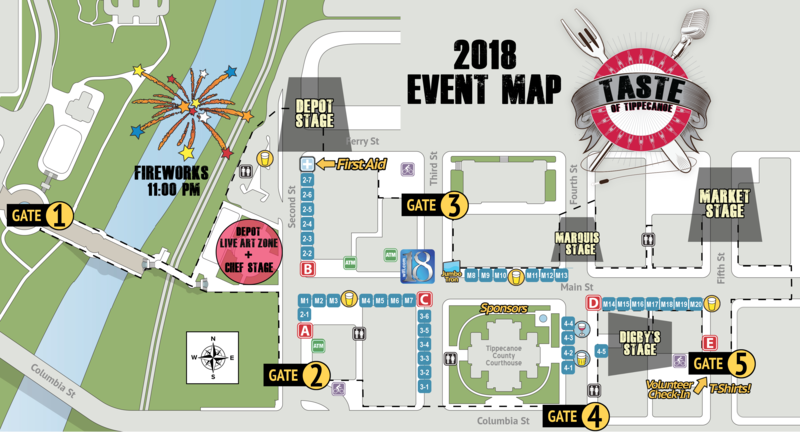 Gates 1-5: These are the entrances to the event. Tickets day at the gate will be $10. You can buy pre-sale at Pay Less Super Markets and the Tippecanoe Arts Federation until Friday, June 15, for $5.00! Ticket booths: Labeled with red icons and white letters this is where you will get tickets for food and drinks. Food and drinks are labeled on the map with a blue icon. The Adult Beverage Gardens are labeled with beer and wine glasses. ATM’s are labeled with a green icon. Don’t miss out on your favorite local artists! Here is the lineup for each stage! For more information about this event visit the Taste of Tippecanoe 2018 website!